Currently the Manage External User button and the nested buttons it hosts are not available in the lightning user interface, as a result users have to switch between lightning and salesforce classic to access the functionality, another drawback to lightning as having to toggle back and forth between two different interfaces undermines the value of lightning. Please make the manage external user button and the nested buttons it hosts available in lightning! Great to see this functionality added to Lightning however the User Interface for the partner still seems to be "Classic". Is it possible to view as an External User with the new Lighting interface? In the Winter '18 edition, the functionality is present! At the Contact, there are buttons 'Enable Customer User' and 'Enable Partner User' by default. 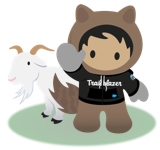 At the Account, the buttons are not set by default, but can be added to the page layout ('Enable as Partner', 'Disable Partner Account' and 'Disable Customer Account' at Salesforce1 and Lightning actions). Within the Winter '18 release notes, did the verbiage change from Manage External Account? If so, what did it change to? Thank you!! If we are to recommend - as the solution architect - a cloud strategy where the Sales Cloud and Community Cloud work well together and if we want lightning to take hold this is a must! Further urging folk to read @Clement Chen's post. Read the Winter 18 Release Notes and/or look at your Winter 18 preview. The functionality is coming. @Richard Fosu see the comment two below from Clement Chan! Actually just read Clement Chen's post! Needed as Users effectively have to navigate to Classic UI all the time, especially if with the Winter 18' release Admins can "Lock" Users from navigating back to Classic view???? @Clement Chan, thanks for sharing, this is what we've been waiting to hear! We just went live with SF (Lightning) and this is one of the biggest pain points reported by our users. Having to toggle back and forth between Lightning and Classic all day long to support client experiences is disruptive to workflow and time consuming. Urgent fix required. If you want people to stay in LEX, these are the basic types of things that need to be fixed. Will this be fixed in the Winter '18 release? It looks as though the current workaround is switching to Classic... very fiddly.